For any Halui examples to work you need to add the following line to the [HAL] section of the ini file. To connect a remote program start button to LinuxCNC you use the halui.program.run pin and the halui.mode.auto pin. 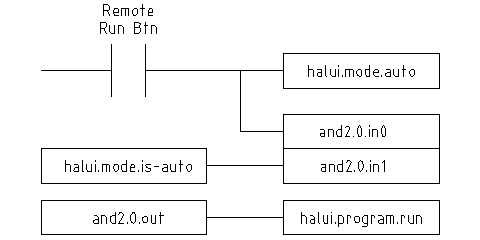 You have to insure that it is OK to run first by using the halui.mode.is-auto pin. You do this with an and2 component. The following figure shows how this is done. When the Remote Run Button is pressed it is connected to both halui.mode.auto and and2.0.in0. If it is OK for auto mode the pin halui.mode.is-auto will be on. If both the inputs to the and2.0 component are on the and2.0.out will be on and this will start the program. In your customized hal file, add the following two lines that will be connected to your I/O to turn on the program pause or to resume when the external system wants LinuxCNC to continue. net ispaused halui.program.is paused => "your output pin"
net resume halui.program.resume <= "your input pin"
Your input and output pins are connected to the pins wired to the other controller. They may be parallel port pins or any other I/O pins that you have access to. This system works in the following way. When an M0 is encountered in your G-code, the halui.program.is-paused signal goes true. This turns on your output pin so that the external controller knows that LinuxCNC is paused. To resume the LinuxCNC gcode program, when the external controller is ready it will make its output true. This will signal LinuxCNC that it should resume executing Gcode. The "resume" input return signal should not be longer than the time required to get the g-code running again. The "is-paused" output should no longer be active by the time the "resume" signal ends. These timing problems could be avoided by using ClassicLadder to activate the "is-paused" output via a monostable timer to deliver one narrow output pulse. The "resume" pulse could also be received via a monostable timer.